We introduce you to ‘The #PressForward Podcast’. It’s a new project that we hope your going to enjoy. The idea of the podcast is to support the aims of WP&UP in offering support for members of the WordPress community. Each week we will have guests on to talk about WordPress related things, but also to address some of the areas that don’t usually get covered, such as mental health. In this, the first episode, we speak to Dan Maby, the founder and CEO of WP&UP about the aims of the charity and what its purpose is. We discuss at length what support WP&UP is providing and how you might get involved. We then move on to chat with Giles Hales-Tooke. He talks very candidly about his battle with anxiety. He explains how it manifests itself and how he’s managed to stay on top of it. Nathan Wrigley: 00:13 This is a new podcast from WP&UP. We’ll explain all about what they’re doing in the next few minutes. For now, you just need to know that we’re creating this podcast to help you, help you connect with other people in the community and hopefully have some fun along the way. When we decided to put this podcast together, we didn’t know what format it should take. Should we have interviews and have guests or just talk amongst ourselves? We still don’t know, but what you’re hearing is where we are now. This podcast is going to be a journey and we’ve just taken the first step. Okay, so much for what we don’t know. What about what we do know? We do have a purpose, but it’s not wrapped up in the format of a podcast. Our purpose is to help help with what. Well, anything rarely. We’re here for you when you need help or you’re not sure what’s gone wrong. We’re here for you, your colleagues, anyone WP&UP is a charity that you can reach out to when you think that you might need some support that could be support with your mental or physical health or perhaps you feel like your skills need updating. All your business needs. A helping hand. You might be wondering what a charity supporting the WordPress community has to do with a podcast. Well, we’ll be inviting people onto the podcast from our wonderful community to share their stories and relate their experiences. Some of those stories might be very personal. Some might tackle issues that are close to your heart. It might be someone talking about their mental health one week and running a business the next. It’s supposed to inform you about the WordPress community at large and paint a picture of the people who make up that community, their struggles and their successes. That picture might look familiar to you because your part of that community too and going through similar experiences. And that in a nutshell is the intention to let you know that there are people out there who can really understand what it’s like to do what you do. That there is a way that you can connect with those people if you want to. Perhaps the best place to start is at the beginning. The beginning was the thought in the mind of Dan Maby. Nathan Wrigley: 02:56 My personal journey with WordPress started in 2005. I have been self employed for 22 years in one form or another. But I, I had taken a change of direction with my business, changed direction in my career and started developing sites for friends. Uh, that turned into friends of friends and that turned into friends or friends of friends, uh, eventually evolving into, uh, the agency that are unstable if 37. Through that process, there was a lot of time that I was spending on my own. A lot of time I’m spending stuck in my own hate, struggling with not being into, to bounce ideas back and forth, not having somebody to say, you know, what am I taking the right group here? Um, what do you think if I, if we do this, is this the right thing to be doing? Should I be taking that route? The, there were lots of issues evolve it developing from this, the isolation. Nathan Wrigley: 03:47 It was a real struggle. I was office, a Home Office based and just simply not having people to talk with, bounce ideas back and forth. It was a real struggle. 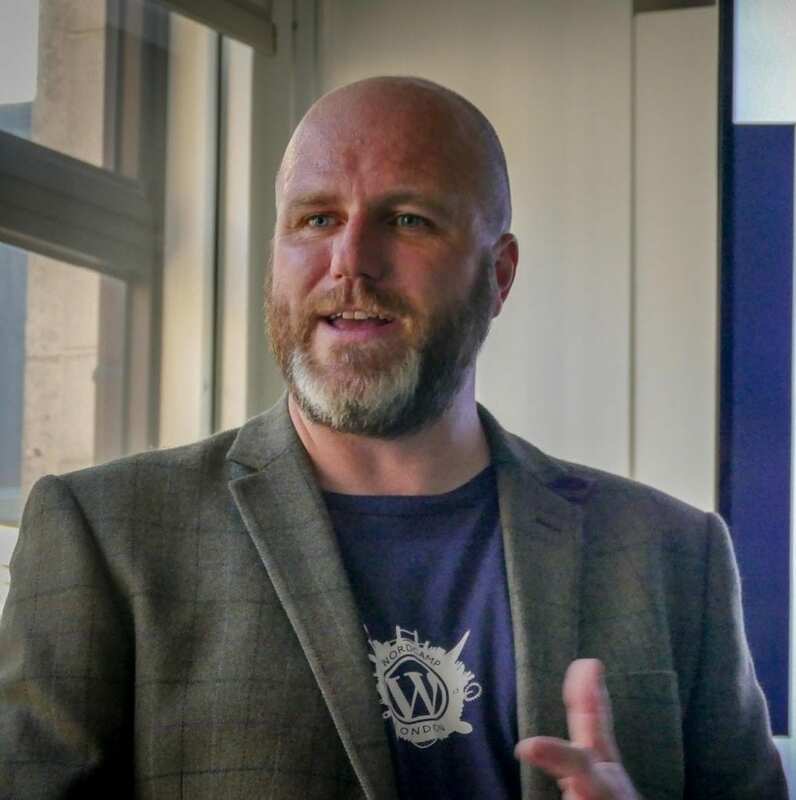 It was around 2014 I’d spin involved in the WordPress London meetup for some time now. Uh, had lots of conversations with 10 days, speakers, sponsors, people involved within and around the community. Getting to really hear similar stories really from people that they were just struggling with isolation with that, that inability to have conversations with people on a day to day basis. I thought, you know, there’s something here. We need to do something to support this. We need to, we need to bring something to the community. So it’s like 2014 I registered, a Twitter handle is, was at WP&UP. Uh, I just really felt it presented a positive connotation for moving forward, progressing. It didn’t have a clue really what this was back then, what this would look like. Nathan Wrigley: 04:47 I just had this desire to bring something to the community, um, to really support individuals and a positive way. Uh, it was around 2017 eventually I got what a group of colleagues, group of friends I’d worked with the past. We came together, but back then we just, we got together and just work through our desires, our wants, what we wanted to deliver a bring to the community. And initially there was a lot of discussion around what’s WP&UP is what type of services it would deliver and everything. All the conversations we were having, we were realizing that it was leading back to a mental health and wellbeing. So realize that actually that that needed to be the focus of WP&UP. We touched on several different areas that could have potentially been the root, the WP&UP took. Uh, but as I say, we, it was really looking at the root, the root cause of the issues that we were seeing within the community. Nathan Wrigley: 05:45 All of this got me thinking that I don’t really know what the word press community looks like. I know that there are a lot of us, but how do we spend our days? Oh, he mostly in offices are working alone. Does one work environment have benefits over another? Is this data even available? Dan Maby: 06:05 We’ve got mental health and wellbeing survey that we’ve just released. Um, they can be accessed by a WPF app.org forward slash go and intention for that survey is to start answering some of these questions. Um, and to start collecting that type of data so we can be better informed to deliver services within our community. We don’t have specific data right now. We have data that relates to um, or they’ll give you an example. The NHS Information Center for health and social care offers data around individuals that are classed as self employed, web developers and designers. Somewhere in the raging current. In the UK alone, there’s four, 4.3% of the UK self employed workforce are diagnosed with a mental health related illness that only includes individuals that are within the UK, registered as self employed and have actively seeked a support from a mental health perspective. So gone to see a GP come see a mental health specialist, a registered through the NHS systems. So of course that number is a far, far higher number when we look at the individuals that are suffering or when we realized there are many, many individuals suffering in silence, uh, individuals that haven’t stepped forward and seeing a mental health professional or a visit to the GP to discuss issues. I’m going to put that into context as a round. It’s a little over 3000 of our colleagues that are registered, self employed and have Seeked medical advice relating to this. Just within the UK alone. Nathan Wrigley: 07:37 That’s a lot of people. But remember, that’s just the number in the UK. We know that most people using WordPress, I’m not in the UK, so I wanted to know if WP&UP is planning to support people all over the world. Dan Maby: 07:54 So we are a UK registered charity. Our mission is to support and promote positive mental health within the WordPress community. Of course that WordPress community as a global community. So we don’t see any boundaries in relation to the, the support and services that we are delivering a course. There are practical issues in regards to that’s this. There’s many issues when we’re looking at mental health and wellbeing, when we start to need to incorporate the cultural differences, religious differences. So when once we start crossing borders a country borders, it becomes much more challenging. Um, but it’s a challenge that we have stepped up to undertake. It’s something that we wanted to deliver on a global scale. We are already supporting quite a number of individuals outside the UK. Nathan Wrigley: 08:40 I wanted to know what the legal status of WP&UP after all, if you call them up, you might want to discuss something personal, something that you want to make sure is kept confidential. WP&UP is a UK charity. What does that really mean and what assurances does this give people, Dan Maby: 09:02 The registered charity status within the UK means it is an entity that is registered by the UK Charities Commission. This process for us looked like a 23 week process from initial application to completion and receipt and for us to receive that charitable status, the same as a 23 week period or four lots of hoops to jump through. Uh, an awful lot of time, people efforts to, to get us to that stage. The Charity Commission is a body that will regulate, uh, registered charities. So looking at the responsibility of how we’re using our finances. For example, something that we are very keen to followings and maintain is a very transparent, open the process here. So we were actually making as much of our information publicly available as possible, including our financial records. But, um, as a registered charity, there was a, um, a legal requirements to have elements of your financial records publicly visible. That’s, there’s an awful lot of other kind of red tape because we are a registered charity. So it really means that we are a body that is accountable. Uh, we’re not just an organization that’s simply can run off and do its own thing without any, let’s say any accountability. We have our, we have a constitution that constitution sets out. I’ve rules state what we can and can’t do as an organization in regards to our activities. So there’s, there’s been an awful lot of work to get that. So to get all that in place. Nathan Wrigley: 10:33 So WP&UP is aiming to become a worldwide charity offering support to anyone who needs it. That’s going to cost a lot of money. How is WP&UP going to make sure that it’s sustainable into the future? Dan Maby: 10:49 Initially when we were discussing as a, as a group of, um, colleagues before we were trustees, it was, we were looking at what we were doing here and we were looking at what could be potentially offered. And there were some questions that came up about this potentially being a for profit entity. There’s, there’s ways of actually delivering a service here that’s, that could be making, we could make money from it, but we very quickly came to the conclusion that this wasn’t right. Yeah. This needed to be people focused. We need to do short. Everything we’re doing is focused and centered around the individual that we’re delivering support for. So going down the route of creating a charity and nonprofit meant that took away that requirements to be focused on profit. And actually we are now focused on the individual and the support has been delivered for them. Dan Maby: 11:35 But of course we still have to be funded. We still need money in the bank to enable us to purchase services to oil staff, to deliver the, uh, the various mechanisms of support that we have. Um, so of course that money has to come from somewhere. We, we’ve put together a sponsorship package that enables businesses to sponsor us, are grateful to Green Geeks who have that a first company to sponsor us to date. We also had a couple of sizable donations from other companies. So the, that particular shout out for WPMUDev, who these, these organizations have made financial donations to the charity. There’s no expectation of anything in return for that, for that donation. But of course, we also have public donations and we’ve, we set an initial funding goal of 260,000 for year one, the split was between a corporate sponsorship, government grants and public donations of that year. One funding goal, 10,000 pounds of that was to be a two raised via public donations. Now we actually almost hit at 10,000, donate 10,000 pound for public donations, uh, within three months of launching the, um, uh, of announcing the fact that donations were available, that people were able to make those pledges. So we are incredibly humbled by the fact that we recognize that their community was wanting to support, uh, an entity such as this. The sponsorship options that we have, um, are tailored to the individual companies. There are a number of services that we’re delivering. We can deliver exposure of those sort of those companies throw out the services that we’re offering. Nathan Wrigley: 13:11 So we know that companies are able to sponsor WP&UP. But what about individuals like you and me? Can they get involved and give a little? Dan Maby: 13:22 So if individuals are wanting to support us, uh, if you visit WPandUP.org Forward slash give, you’ll find the option on there to, to make a donation. Um, oh, 100% of that donation goes to the charity. You get the option to, to set it as a recurring donation if you, if you, uh, if you’re so inclined. Um, and as I say, everything that comes through those directly into developing services to provide support. So we’re so grateful for every single penny that comes into the charity. The, the funding goal of 260,000 that we set at the start of this process feels like a large number. Um, we’ve quickly come to realize that the, the need, the demand for support within this within the community is far, far higher than we’d initially set out with the expectations of the information that we had to time. Uh, so we’re needing to progress this at a, at a higher pace and stop bringing additional funding to deliver additional levels of support. Nathan Wrigley: 14:26 What I wanted to ask Dan next was whether or not the charity had actually started working with people in the WordPress community. Have people been receiving support and what does that support look like? Dan Maby: 14:41 Early 2018, um, we put together a community, uh, sorry, late 2017 actually we’ve put together a community video, uh, also a number of the members of the community to get involved. And the intention of that video really was it, it was intended to be a kind of a hello world. This is something that we need to have a conversation about. This is something that we need to talk about potentially bringing to the community. Actually what happened off the back of that video was we received an awful lot of requests for, for help and w and wanting to have conversations and discussions around receiving support a cause at that time. So throughout the whole of 2018 we were completely unfunded. Uh, we didn’t have any financial support, so everything was delivered via volunteers. We had around 3,800 hours, volunteered in that 12 month period, delivering, delivering nearly a thousand hours of support, mentorship and companionship to there, to the community, to the individuals reaching out to us. So it’s been a real eyeopener for us to see that we’ve, we’ve had the community reaching out, individuals wanting support, wanting companionship, wanting mentorship. But we’ve also, as I said, mentioned earlier, we’ve had the individuals wanting to support from a financial perspective. So it’s been a, there’s been a lot of evidence that not only does the community require this level of support, but this community also wants to support this kind of support. It’s been very, very humbling actually to see the responses. Um, and messages from people coming in in regards to this, a lot of the, um, the, the initial contact and support that we receive comes through via text as opposed to a text formats as opposed to phone. Um, we do have a phone number available. You can, you can contact us on +44(0)20 3322 1080 I would double three double to 10 80. Dan Maby: 16:40 That is a UK, a UK number. Uh, we are currently in the process of actually pulling together a number of phone numbers are global numbers, so we don’t simply just have the UK support access via phone. We also have live chats, we have a slack team. We have, um, of the email and contact forms there. There are several ways of communicating with us, the vast majority of individuals that come through that reach out our fire text formats so you can email [email protected], uh, that we’ll get an individual into our support process, support systems. Um, from there we then reach out and have a conversation with, with an individual to, to work out what it is that the individual is struggling with. Um, uh, and to work out how best WP&UP can support that individual. We have our four health hubs, a business health are skills, health, our physical health and our mental health hubs. We found over the 12, 18 months that we’ve been supporting individuals that a lot of, uh, almost every everyone will fit into one of those four health hubs. And delivering support requires us to get an understanding of that individual and what they’re struggling with. So everything we’re doing is tailored for the individual. There’s no one size fits all solution here because of course we’re talking about people. I don’t see everybody’s unique. Nathan Wrigley: 18:10 If you go to the WPandUP.org website, you’ll see that the support is grouped into four areas or hubs, mental health, physical health skills, health and business health. Perhaps we have an understanding of what the mental health hub might offer, but what about the other three physical skills and business hubs? What are they all about? Dan Maby: 18:38 So physical health is one that I personally struggle with the most. There’s a direct correlation between our physical health and our mental health. We find that, oh, certainly again, this, this came from a place of experience, um, for myself and other individuals in the, um, in the initial development of WP&UP that we could spend an incredible amount of time sitting at our desks. Um, not getting the physical exercise, not getting the, the just simply getting up and moving and that can have a real negative impact on our mental health. The, the, we’re not just talking about physical movement though. We’re talking about diets. We’re talking about just, just simple, simple things like intake of water. Um, all of these things can hurt if not managed and not maintained, going to have a real negative impact on ourselves and our mental health. Nathan Wrigley: 19:31 With the physical health hub, I know that we all need to get plenty of exercise and have a healthy diet, but I wasn’t sure what WP&UP would be able to offer me. Is it going to be a knowledge base of useful information or would I be able to speak to someone directly Dan Maby: 19:50 Bit of a mixture plus some extras? We’ve got, mental health, sorry. Our physical health advisor is developing a lot of the services at the moment that actually deliver mental ship, um, around this and that she, um, we delivered through the month of January, our mentors in movement. So the concept was actually having a mental, uh, getting our mental calls, getting my mastermind type group together. But instead of sitting at our desks having that call, we were actually getting out and moving. So we were on a stick the headphones in, go for a walk and have that call. So there was that, um, accountability, the physical exercise and physical movement. Um, but of course at the same time getting some of the, uh, the, the, uh, either the business or the skills, uh, mentorship as well. Nathan Wrigley: 20:34 I wanted to move the conversation onto the skills and business hubs. It’s not so obvious what their purposes are. So let’s start with the skills hub. Dan Maby: 20:46 So skills health was initially born out of our, what was called our code health hub. But we very quickly realized that a calling, our code health hub was very exclusive. We were very focused on the individual, the individual’s developers that were writing code. Funnily enough, the vast majority of individuals that we talk with come through the skills health hub. I’ll have a, have a link to the skills health hub. We’re partnering with a number of individuals in and around the community, um, that deliver training and educational or training and education material. The skills health hub is really looking at the individual. If the, if a skills gap is causing, uh, a, an issue for them from a mental health perspective, we can then look to potentially try and support that, uh, and signpost into the most appropriate training and education material that’s available. Common example that I give here for this is an individual fantastic developer, um, really knows how to a, to write some great code, but it has no experience of marketing themselves. So they’re trying to be a freelancer trying to run a business, producing fantastic products within their, their skills. But to actually then go and market themselves as she starts to be able to support themselves financially. So we can then look at the skills health hub and say, okay, well clearly marketing is an issue here. So let’s look at the training and education material that’s a, the can support this Nathan Wrigley: 22:18 And the business hub. You might need some support with the mechanics of running your business. That could be writing a proposal or getting your tax documents submitted correctly. Is that the sort of thing that the business hop deals with? Dan Maby: 22:33 So the business health hub is a, it’s almost a subsection of the skills health because of the community that WP&UP is supporting. A large proportion of the individuals that we see are self employed or are responsible for their own running of the businesses are running a business. And so the business hub, we felt it was important to have a specific service that supports that, this, this group. Uh, so within it we have mentors, we have individuals that can support from quite a wide and varied levels. So we’ve got individuals that have spoken to us as freelancers and we’ve also got individuals that I’ve spoken with us as large agency owners or courses as business owners. We all have challenges and things that we face on a day to day basis. We talk about that would be an up supporting the freelancers, solo business owners, distributed team members, but often it’s also there’s that adage of it’s lonely at the top, uh, the business owners that may not necessarily be able to then communicate with their staff the challenges that they’re facing. Nathan Wrigley: 23:38 When I hear the word charity, I immediately associate this with free to use. In other words, I can use it and it’s not going to cost me any money. Is this the case for WP&UP? Is it in fact free of cost to me? Dan Maby: 23:56 Currently we don’t you out. There are no charges for the services that are delivered by a double peanut. We are working very hard to maintain that. The last thing we want to do. If an individual is approaching us and they are struggling with their business and it’s having a negative impact on my mental health, the very last thing we want to then do is hit them with a big bill to try and support them. So of course working with strategic partners, um, uh, such as Green Geeks and WPMUDev, Pragmatic, Motional, uh, to try and deliver these services. Free to end user is the goal here. Nathan Wrigley: 24:31 The whole point of WP&UP is to offer support to assist people in moving from one place to another. I wanted to know if this is actually happening. Are they real people like you and I who are having success moving through WP or not? Dan Maby: 24:48 It’s been an incredible experience to be honest, that we are, it’s always very difficult because we don’t want to be sharing any information of any even individuals specifically. But there have been some, some real success stories so far. Um, through, through WP&UP, it’s been wonderful to see the growth and development of individuals. Uh, as I’ve gone through through these processes and hearing the stories of other conversations and people that are progressing through this. A big part of what we do is just that, just simply enabling people to talk about mental health, just being, just encouraging people to open up even if it’s not in a direct between that individual and WP. Nope. I’ve, I’ve given talks at the events number of times and every time it feels like people are just been waiting for permission to talk about the challenges have been facing the mental health related issues and it’s humbling every single time the communications that we get either directly at their event or post event to and seeing the journey of these individuals. So over the last 12 to 18 months, um, has certainly made all this completely worth it. Nathan Wrigley: 26:00 And isn’t that the point? It’s about having a positive impact upon other people. Just before we finish speaking to, damn. I wanted to give him the floor to have a chance to say anything he wanted to. So Dan, maybe from WP&UP, thank you very much for all that you do. Dan Maby: 26:20 Yeah, sure. I mean we, WP&UP can be reached at WP&UP a website is WPandUP.org if you want to get in contact with us, go forward slash contact all of the information. Everything that we discuss is handled confidentially. Nothing is shared. Other than that, I just, I would just like to say a huge personal thank you to all the volunteers to everybody over the last 12 months have enabled WP&UP are up to grow to this and to get to this stage. Um, the fact that we are sat here recording a podcast to talk about WP&UP, it’s wonderful to see that this is becoming a thing. This is something that we are delivering to the community and just, just remarkable. This is, this is very real. This impacts people’s lives in a very real way. And I just wanted to say a huge thank you to yourself, Nathan [inaudible] and because everybody else has been involved, um, it’s, it’s, um, it’s been an amazing journey so far, but we have literally just started the journey. So looking forward to where this goes Nathan Wrigley: 27:28 Ff you’re still with us, great. We appreciate your support. When this podcast idea came up, I was thinking about how I was going to convey the idea of what WP&UP is all about. So that’s why you heard from Dan. Hopefully that gave you some context about what the mission is and what the sort of problems are that we’re trying to help you with. It’s a difficult thing to talk about and if I’m honest, it’s a difficult thing to make a podcast about. I’m going to keep going though because this is something that I believe in and maybe you do too. As the weeks go by and you listen to more of these episodes, you’re going to hear from people who’ve have their own stories to tell. You’re going to find out about their downs and ups and the way you that they’ve tackled these. Nathan Wrigley: 28:16 Some of the things that we’re going to encounter are related to mental health, but as you just heard, that’s only one of the strands that WP&UP is trying to assist with the other hubs, our physical health skills, health and business health in future episodes. Well on wrap, what all of those mean, but for now it’s enough to say that WP&UP is trying to help you succeed and that might mean getting you help with your business or the skills that you feel you’d like to do this work. We need your support. That could be just listening to this podcast or perhaps donating your time or your money. Sponsorship is also an option and sponsoring WP&UP is a cool thing to do. You got a whole heap of benefits, but from my point of view, this one is the coolest. Nathan Wrigley: 29:23 Today the WP&UP podcast is sponsored by Green Geeks. Green Geeks offers an awesome managed web hosting platform that’s built for speed, security and scalability while being environmentally friendly. Enjoy better web hosting experience for your WordPress backed by 24 seven experts support and we thank Green Geeks for their support of the WP&UP podcast Nathan Wrigley: 30:02 So there’s a serious point to this podcast. We want you to listen to it in the weeks to come and feel that you’ve been educated or entertained or both, but we also want you to become aware that WP&UP is a real thing set up to help real people. With that in mind, we’re going to be sharing stories from people who have asked to be involved. Each story will be different, but by sharing their events we might all be better able to understand what others have been through and perhaps the situations described will be something that you can identify with. Today’s story is from Giles. It’s about his anxiety and recovery. So this is a trigger warning. Next we will be talking about anxiety and recovery. If you are impacted by this subject, you can skip this section which is roughly 12 minutes in length. Giles: 30:59 So my story begins 20 years ago. I’m working in film or TV, having life of Riley and then through a series of circumstances I’m not expecting my life explodes and I suffer my first panic attack. Um, from that point to the next three years, my life is ruled by a fair, a panic and anxiety. And the best way I can describe it is that it is a living hell. It’s kind of like a twilight zone where there’s me and then there’s everybody else and everybody else is living what appears to be a normal, happy life. They are going about having a normal, doing normal, happy things, things that normal people do. Giles: 31:52 And over time I become aware that I am less able to do normal things and that my life is starting to shrink the beginning. It’s small little things and that kind of things that I’m able to pass away and not really kind of pushed under the carpet. Pretend they’re not happening, but at the time, the fear of anxiety and the fear of panic get a stronger hold and they’re more things that I’m aware I cannot do, I cannot do for fear of triggering off another attack. That first attack was so terrifying. I s I just never ever, ever want to go back there, so I just want to stay clear of anything that’s going to possibly kick another one off. But the problem with anxiety as it increases its grip is that the more things that I can’t do anymore, so it gets to a point where my life is so small, it’s pretty much my bedroom and I start to get to a point where I think I don’t want to be here anymore. I never said that the I realized I need to reach out for help. Nathan Wrigley: 33:26 When you had your first panic attack, was there a moment, a catalyst, an event that you now look back and think that was the cause of it or did this sort of slowly build up over time and manifest itself in this one moment? Giles: 33:45 That’s a great question. I started to notice that people weren’t question or kind of bank tellers would look at my signature. Um, back in the day, most things had to be done by check. If you wanted to get cash out yet to go cash a check. And I would notice, tell us kind of looking at my signature maybe once or twice. And that was when this little voice popped up in my head and said, what if they’ve said no? What if they say you can’t have your money? I kind of, what’s important about that is sometimes these little pre thoughts. What I now know is that that was leading up. That was a seed. One day I went to the bank, very hungover with a huge amount of coffee intake. So I kind of had the shakes and I went to sign the very last check. And again, the teller looked at me just as I was about to start signing and that voice came in my head anyway, what it and that was the trigger that started the panic attack off. Nathan Wrigley: 34:59 What the a reason why in your own mind it was associated with this signing of a check because that’s quite a specific specific thing. Um, and so somebody from the outside listening to that story might be wondering, you know, are there other people who have different triggers? Um, equally specific Giles: 35:23 Anxiety can come in many shapes and forms. Sometimes there are very specific triggers. Other times they can be wider things, maybe things that are less clearly identifiable. The unique point is is that there is somewhat a trigger whether you are consciously aware of it or not. Um, it doesn’t really matter. There is something lying and it’s one, once we become aware of the potential for this thing to explode, that the real kind of mental disease starts to kick in. Nathan Wrigley: 36:02 You said earlier that it was an experience you never ever wished to have again. Would you mind describing what it feels like so that people can have an understanding? Giles: 36:15 Um, I heard an analogy once, which I think is great too. It’s like when you’re taking your chair over tip and you got some… With panic, it’s longer, it’s more sustained. It can start with a skidy kind of feeling, a loss of concentration. Uh, actually it’s part of our, our brain is starting to shut down and to go into fight and flight. Um, I harrowing a hearing can become echoy, uh, an increase in heart rate, hot flushing with some people, a fear of defecation. These are all things that are, are typical symptoms of going into fight or flight, getting ready to fight or to run away. It’s just, it’s happening in a circumstances that we wouldn’t associate with needing to get ready to fight or flight. Nathan Wrigley: 37:03 Is it sustained? Does it go on for a fixed period of time or can it go on for many hours or possibly days? Giles: 37:12 Yes, it can. Um, what, uh, as long as there is some trigger that still present, it can continue. Um, the, the physical side of anxiety, the actual arousal, the release of Adrenalin, well, once the trigger is stopped, that takes about half an hour to start to break itself down. That mentally the, um, ability to trigger and to re trigger, think about an issue, think about it again, think about it again. Can put this into a state where we are aroused and either partially or wholly in a state of anxiety can lost a considerable period of time. Nathan Wrigley: 37:54 And does it impact upon your life at the time it’s happening or are you able to, to carry on regardless during these panic attacks or must do sort of isolate yourself and go elsewhere and take time off work for example. Giles: 38:10 It’s, it’s with you for as long as it’s with you and you can take it absolutely anywhere and it will accompany you, you everywhere. So, um, that’s, that’s one of the kind of issues is that it’s in your head, it’s going to follow you and once it starts to get a hold on you, it’s a different story to actually get rid of it, to switch it off. Nathan Wrigley: 38:34 What people know that you were having a panic attack. If I was to be sat in a room with you during one of these episodes, would I be able to see it or could you cover it up? Giles: 38:46 Good question. It is possible to be in a state of anxiety and control it. And in actual fact that’s one of the steps to recovery. But somebody and a full flight panic attack could be pretty noticeable. The, the fact that while may collapse is, is could be extreme, um, accelerated breathing. Uh, yeah, the science can be pretty obvious that some people may be good at, at covering it up at containing it. But yes, a full blown is a, is a pretty obvious thing to see. Nathan Wrigley: 39:22 And you mentioned there that you’ve, you’ve got strategies, techniques for coping now would you like to tell us about what it is that you’ve done, who you reached out to, who you spoke to in order to get your, get yourself along this path? Giles: 39:38 Yes. So as I say, this stop was reaching out and then when I started to reach out, that’s when everything changed. And the first step is really to find the right set of people to help. Um, anxiety is a result of something. So what is that something that’s causing the result? So finding people that are able to help you with the particular thing that you’re suffering. That’s really the key. Now I was lucky because I have members of my family and my close friends who are counselors. So when I reached out, I reached out to them and they all said, okay, go shopping around. Go and have a look for the type type of things that you feel comfortable with, the type of people that speak your language the way that you like to talk. And that was a really key change for me was to, I actually thought, yes, I want to try therapy. Some people don’t want to do that and that’s absolutely fine. So really the start is to just to speak to somebody. He can say, well, let’s have a look at some alternatives for you. What kind of thing feels good for you? What feels comfortable for you? And that’s really a key thing is to kind of went, oh well maybe I’d just like to talk to a bunch of people. Or in my case I thought, no, I want to go find somebody really knows about this stuff. And that was change step was finding somebody. And I can remember, she looked at me on the first meeting and she said, um, should I let you into a secret? And also, okay, she said, I love panic. I was like, you what? This thing has brought me nearly to the end of days, it’s, it’s ruined my life for three years and you love this thing. You must be nuttier than me. And she said, no, because it’s so easy to fix. That was the key for the first time in three years. I thought, number one, I can do this. And number two, I felt a flicker of optimism and a flicker of hope. Nathan Wrigley: 41:52 There is light at the end of the tunnel area. That’s great. Giles: 41:57 What I learned was, you know, fantastic. I learnt how to fight back that um, I loved, first of all, what’s happening to me and that anxiety and panic is just a fight or flight system running on overdrive and that I’m not, not a big step. Then I learned about strategies to start pushing back. And then, and this is a really key thing, is I started to learn about building a wellbeing routine, a routine that helps me get into a better spot. We used to the principle of needing to exercise our bodies to get into a good space. Well, we need to do that with our minds sometimes as well and then say, you know, I’ve been in remission 20 years now and it’s big. It’s because I have a wellbeing routine, but I practice every day. I still have times when I can feel challenged and can feel w but I know no, this thing is under control and so long as I continue my routine, I can stay in a good space. Nathan Wrigley: 43:15 The WP and UP Podcast was sponsored today by Green Geeks. Green geeks offers a specially engineered platform that offers WordPress users web hosting that is designed for the fastest, most secure, scalable hosting available in multiple data centers. Their WordPress hosting makes deploying and managing WordPress websites easy with automatic one click install managed updates, realtime security protection, SSD raid 10 storage arrays, power cacher, and expert, 24 seven support to make for the best web hosting experience. And we think Green Geeks for their support of the The WP and UP Podcast. Nathan Wrigley: 44:05 Hey, that’s it for this week. I hope you enjoyed it. Remember that there’s help available for you or people you know over at WPandUP.org please spread the word about this new podcast. Tell your friends and subscribe on Itunes or your favorite podcast player. So until next time, #PressForward.